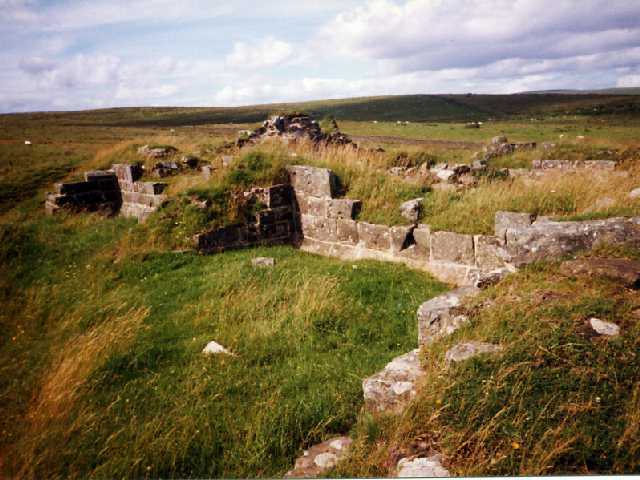 Remains of Dally Castle, Greystead. Photo by Northumberland County Council. Greystead parish lies in west Northumberland not far from the Scottish border. It stretches from the valley of the River North Tyne across high moorland to the county boundary with Cumbria. Today, most of the parish is planted with trees, being part of the border forests of Wark and Kielder. The name Greystead probably means the farm where a reeve lived and was known as Grievesteads in the 17th century. Archaeological remains in the parish date from the prehistoric period to more recent times, but most are medieval and post-medieval sites. There are very few prehistoric burial sites known in this area. A Bronze Age cairn stands near Tom's Crags, and a possible Neolithic long cairn at Black Knowe. There is also a pre-Roman earthwork running through the parish called the Black Dyke. It is a bank and ditch that runs through this part of the county, but no one knows what it was used for. Near Low Carriteth Farm is a small enclosure that may date to the Roman period. Although it does not look like the many other small settlements built at this time, the way it is built and its size are similar. The parish was settled in medieval times but there is little evidence for actual villages. The manor of Chirdon is recorded in the 13th century but nothing is known about a settlement here. A few other villages have been suggested at Hott, Dally and Snabdaugh but there is even less evidence for these. The most common signs of human habitation are the many shielings dotted around the parish. They lie by small streams or take shelter beneath crags and lie in some of the most remote places in the county, such as at Paddaburn Crags and Woolfe Kennel cave. Shepherds looking after sheep on high pasture probably lived in them in the summer months. A number of small farms have also been found by streams and were probably more permanent settlements. In medieval and early post-medieval times the border between England and Scotland was very unsettled, with battles, skirmishes and raids taking place on both sides. Greystead lies very close to the Scottish border and would have been in the thick of the action. There was obviously a need for some defences because Dally Castle was built in the 13th century and extended in the 14th century. Later, as feuds between border families continued, they were known as Border Reivers, it was necessary for those who could afford it to build special defended farms that we now call bastles. The remains of two such buildings stand at Snabdaugh and Stokoe Crags, but there are also other references to buildings that no longer exist at Chirdon, Birks and The Bower. In the 16th century The Bower was the home of one Hector Charlton said to be one of the greatest thieves in the region. As the Borders became a more settled and peaceful area in post-medieval times it was a fairly prosperous time for this region of England. Elsewhere in the 17th and 18th centuries, people started to invest more in their surroundings and new farming methods were introduced, but here the high and remote moorlands may have changed very little. Some small farms did spring up, such as at Noble Shields and Muckle Samuel's Crags, and others expanded around older defensive buildings such as Snabdaugh bastle. Part of the parish belonged to the Earl of Derwentwater whose lands were confiscated for his part in the 1715 Jacobite Rebellion and were then held by the Commissioners of Greenwich Hospital. They built the Church of St Luke in Greystead in 1817. Dallycastle Mill was also built about this time because of the increase in farming demanded by the wars between England and France, but was only used for 40 years. Few industrial activities seem to have sprung up here at this time other than lime burning to improve the land, with lime kilns by the Chirdon Burn. One of the most recent monuments to have been built in the parish was the Lord Robinson Memorial in 1953. He was chairman of the Forestry Commission whose impact on the appearance of this part of Northumberland has been considerable.